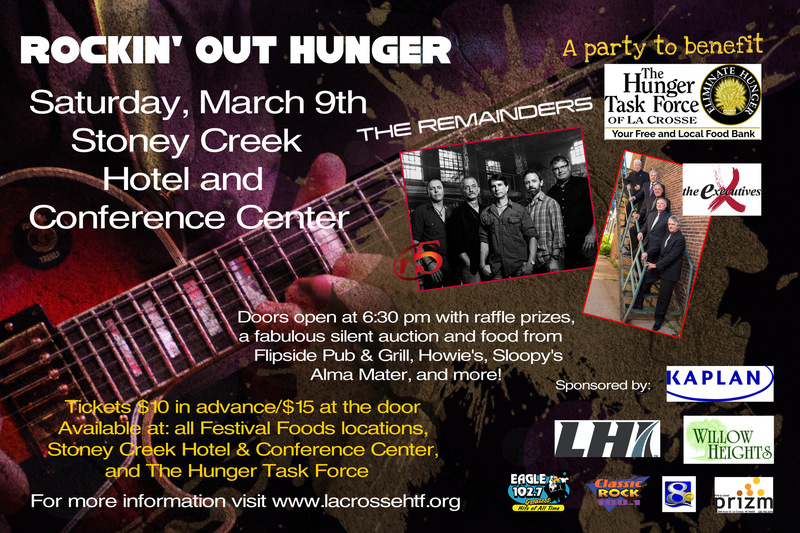 Join us for a night of music from The Remainders and The Executives, a silent auction, raffle, dessert auction, and food for purchase from Flipside Pub & Grill, Howies, and Sloopy’s Alma Mater. The 14th Annual St. Paddy’s Day .01k to benefit The Hunger Task Force of La Crosse thanks to Hatch Building Supply! Register now for $20…that includes your .01K shirt($22 for XXL and XXXL) and your free green beer to celebrate your achievement! Day of registration $25 ($27). Check in on Sat. 16th at Brothers La Crosse starts at 3pm. Race at 6pm..with the official pace car from Sleepy Hollow Chevy Buick GMC. Celebrate the Holiday, bring your friends and help us raise money for The Hunger Task Force. It’s The World’s Shortest Run/Walk from Hatch Building Supply, Brother’s Bar & Grill, Paul’s Heating & Air Conditioning, Auto Value of La Crosse County, Genzie’s Gameday Pub, Century 21 Affiliated, and Sleepy Hollow in Viroqua. The parade will step off at Noon at 2nd & State, proceeding on 2nd St. to Main St. through downtown, ending at 9th St. The Hunger Task Force will be collecting food along the parade route. The after parade social will be held at The Brick House, where you will find friends, great times, live music by Pig Town Fling & Friends, Irish dancers, food and drink. For more info go to: http://www.irishfestlacrosse.org/st-patrickrsquos-day-parade.html.